Peptide (C)RERSIGDVTTAPSE, corresponding to amino acid residues 54-67 of rat NHE-1 (Accession P26431). 1st extracellular loop. Homology Mouse - identical; human, pig, dog - 13/14 amino acid residues identical. 1-5. Anti-Na+/H+ Exchanger 1 (NHE-1) (extracellular) Antibody (#ANX-010), (1:200). 6-10. Anti-Na+/H+ Exchanger 1 (NHE-1) (extracellular) Antibody, preincubated with the control peptide antigen. Immunohistochemical staining of perfusion-fixed frozen mouse brain sections with Anti-Na+/H+ Exchanger 1 (NHE-1) (extracellular) Antibody (#ANX-010), (1:200), followed by goat-anti-rabbit-AlexaFluor-488. 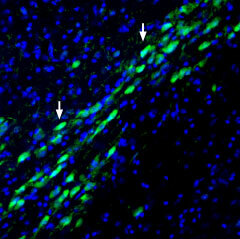 NHE1 immunoreactivity (green) appears in neuronal profiles (arrows). Cell nuclei are stained with DAPI (blue). ___ Cells + goat anti-rabbit-DyLight-488. ___ Cells + Anti-Na+/H+ Exchanger 1 (NHE-1) (extracellular) Antibody (#ANX-010), (1:20) + goat-anti-rabbit-DyLight-488. Cell surface detection of NHE1 in live intact human MCF-7 breast adenocarcinoma cells. A. Extracellular labeling of cells with Anti-Na+/H+ Exchanger 1 (NHE-1) (extracellular) Antibody (#ANX-010), (1:25), followed by goat anti-rabbit-AlexaFluor-594 secondary antibody (red). B. Live view of the cells. C. Merge of the two pictures. Counillon, L. and Pouyssegur, J. (2000) J. Biol. Chem. 275, 1. Kemp, G. et al. (2008) Channels 2, 329. Counillon, L. et al. (1994) Biochemistry 33, 10463. Tse, C. et al. (1994) Biochemistry 33, 12954. Paris, S. and Poouyssegur, J. (1983) J. Biol. Chem. 258, 3503. Aronson, P.S. et al. (1983) J. Biol. Chem. 258, 6767. Yu, F.H. et al. (1993) J. Biol. Chem. 268, 25536. Aronson, P.S. et al. (1982) Nature 299, 161. Orlowski, J. and Grinstein, S. (1997) J. Biol. Chem. 272, 22373. In order to function in optimal conditions, cells must maintain a close to neutral intracellular pH. They have adopted various mechanisms in order to do so, one of which is via Na+/H+ exchangers (NHEs). Genes belonging to this group are expressed along a very broad range of organisms and are essential for protecting cells against intracellular acidification1. To date, nine genes have been identified in mammals; NHE1-9. These membrane proteins have 10-12 transmembrane domains depending on whether a splice variant is expressed and an intracellular N-terminal. The C-terminal domain can be either intracellular or extracellular, also depending whether a splice variant of the protein is involved. The C-terminal part of the protein also undergoes posttranslational modification such as phosphorylation2. Both NHE-1 and NHE-2 have an extracellular loop which is glycosylated1,3,4. Under physiological conditions, the Na+/H+ exchanger mediates the exchange of one extracellular Na+ ion for one intracellular proton, thereby keeping the overall charge neutral1. The extracellular binding site of Na+ is not selective as it can also bind Li+ and H+ 1,5,6. K+ ions inhibit NHE-1 but have no effect on NHE-27. The activation of NHE-1 and NHE-2 is sensitive to intracellular acidic pH. Under physiological conditions, both exchangers are not active and upon a drop of intracellular pH, they are rapidly activated1,5,8. NHE-1 expression is ubiquitous and may serve as a housekeeping gene9. Anti-Na+/H+ Exchanger 1 (NHE-1) Antibody (#ANX-010) is a highly specific antibody directed against an epitope of the rat protein. The antibody can be used in western blot, immunohistochemistry, immunocytochemistry, live cell imaging, and indirect live cell flow cytometry applications. It has been designed to recognize NHE-1 from human, rat, and mouse samples. Human Barrett's esophageal cell lysate (1:200). Laczko, D. et al. (2016) Am. J. Physiol. 311, G16.